Apple on Saturday opened its first retail store in Hong Kong to a crowd of hundreds of customers as part of an effort to continue its storied revenue growth in the Greater China region. The new store, located in the high-end International Financial Center Mall, features an iconic glass spiral staircase and a view of Victoria Harbour. Eager customers lined up for the opening almost two days in advance. The store is said to be Apple's most expensive retail location yet, with estimated construction costs of $20 million. Prior to the opening, IFC Mall staff cooperated to allow fans to wait inside even after the mall closed, and a nearby Starbucks remained open overnight. According to Richard Lai of Engadget Chinese, more than 300 customers had lined up outside the store by 3 a.m. on Saturday morning. Apple's retail foray into the lucrative Hong Kong market has been a long time coming. The company launched its first store in mainland China three years ago. Chinese customers regularly travel across the border to Hong Kong to purchase Apple products. Late last year, fourteen housewives were caught smuggling hundreds of mobile phones and 3G iPads. A 3G version of Apple's touchscreen tablet did not officially arrive in China until earlier this week. The city has become known as a shopping oasis for tourists, especially those from the mainland. Luxury brands and electronics are generally substantially cheaper in Hong Kong than in China. The Hong Kong tourism board reports that visitors from China that spend at least one night in the city spend an average of HK$7,453 ($955) per trip in 2010. ?You can?t ignore Hong Kong, it?s a great retail market,? Bloomberg reported Paul French, founder of market research firm Access Asia, as saying. ?There is a lot of money in Hong Kong.? The Cupertino, Calif., company already boasts more than 100 resellers in Hong Kong. A second Apple retail location is reportedly planned for the city's Causeway Bay district in 2012. On Friday, Apple opened its fifth store in China on Nanjing East Road in Shanghai. The company has said it is aiming to have a total of 25 retail stores open in the country next year, though it does not appear to be on track to reach its goal. Apple has been on a tear in the Greater China region, which includes China, Taiwan and Hong Kong, growing revenues six fold year over year to $3.8 billion in the June quarter. Line waiting to enter IFC Mall Apple Store in Hong Kong. Credit: Gary Allen/ifostore via Flickr. IFC Mall Apple Store in Hong Kong 2 hours after opening. Credit: Gary Allen/ifostore via Flickr. I'm here right now. It's pretty packed. It's really unusual to have so much open space in retail in Hong Kong. Pretty impressive. My estimate would be about 3000 people inside the store right now. Maybe 200 blue-shirted staff inside (I'm not exaggerating) plus maybe 50 security staff managing the line outside and a few inside. Fastest Wifi I've ever experienced. I'm here right now. It's pretty packed. It's really unusual to have so much open space in retail in Hong Kong. Pretty impressive. My estimate would be about 3000 people inside the store right now. Maybe 200 blue-shirted staff inside (I'm not exaggerating) plus maybe 50 security staff managing the line outside and a few inside. Cool! Eyes on site. So what's getting the most attention? Did I hear some one say $480 a share! Late last year, fourteen housewives were caught smuggling hundreds of mobile phones and 3G iPads. You never hear about any housewives smuggling Samsung phones and tablets into China. The crowd of staff cheering loudly as people enter. Inside the shop, people are pretty evenly spread out. I guess some of the early arrivals got a gift of some sort (envy!). I'm a bit disappointed that there are no t-shirts, posters or stickers available for purchase. Wow. When I arrived at 1:15 there was hardly any line at all. Now there are a few hundred people waiting to get in. There are a lot of people in Hong Kong who work half a day on Saturday, typically finishing at about 1PM, so it kind of makes sense. At least a few months ago, the hedge fund and institutional fund managers were voicing their doubts over Apple's growth potential. I often wonder how these idiots get their jobs if they can't see Apple's obvious growth potential. The Chinese themselves claim they want Apple products and they want more stores. More iPhones, more iPads, more MacBook Airs. It's been said that there are at least a few hundred million Chinese that can afford Apple products, so it certainly seems that Apple has room to grow for another three or four years at the minimum. I honestly don't understand what makes those fund managers so antsy. It's hard to figure whether they're actually trying to beat down Apple's share price or are they just that stupid. If Apple doesn't have any growth potential then I'd sure like to know what company does. Apple's iPhone hasn't even captured 30% of the U.S. smartphone market share and iPad sales are just getting warmed up. I think Apple has a shot at being a major force in education and the enterprise with the iPad. If the Chinese continue to take to Apple products as they do now, China sales will certainly help boost global revenue. Apple definitely looks locked in for explosive growth at least three to four years from now. The last time I saw this many excited Apple people at once was during a RMUG meeting, when a guy named Brian, who had a Fat Mac with a 20MB MacBottom, handed out copies of Mac PlayMate. $500 before next year ends. When released, MacPlaymate was considered to be on the "bleeding edge" of Mac development, it was one of the first games to push the Macintosh's "high-resolution" graphics capabilities. Released as shareware in 1986 by Mike Saenz, MacPlaymate defined the "insertion" or what is now correctly called the "interactive" genre of software. MacPlayMate was THE must have, must show-off piece of software you could have in your collection, first time viewers were always "amazed at the realism!" MacPlayMate shot to the #1 spot on the RMUG Software Chart, edited by moi, in meetings, Mr. Saenz was hailed as one of the most talented Mac developers of the day, equal in achievement only to the legendary Andy Hertzfeld. We were such proud owners back then. Here's a MacBottom 20 Megabyte Hard Drive, circa 1985-ish. Retail price of $1499. Don't you just love the color! Early hard drives for Macintosh required drivers and MacBottoms driver was considered the most stable in it's brief reign. 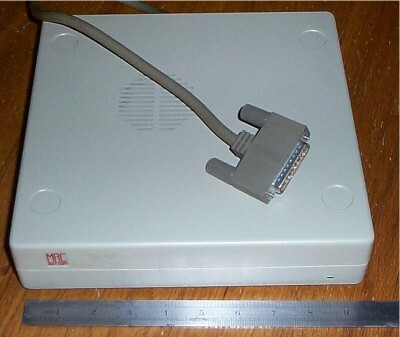 The Mac SE was the first Mac to have an "internal" hard drive - a 20 megabyte, after which, the market for MacBottom's external hard drives sagged and finally collapsed. I'll always find these launches creepy. Here's a video of the launch events. MacPlayMate's author, Mike Saenz, in the "About" dialog box, claimed his work was not pornographic, rather, Saenz made a half-hearted plea that his software should be considered for "educational purposes and enjoyment" and that he sincerely hoped no one would be offended by it's explicitness. At work, just in case the Boss walked up behind you while you were busily "putting it to her" or "learning how Maxi really liked it," Mr. Saenz cleverly included a "PANIC" button that when clicked, instantly filled the the screen with a facsimile of an Excel spreadsheet that contained rows and columns of names and address. The PANIC button was just hilarious - and first time viewers just roared with laughter, they had NEVER seen such a feature! To our delight, Mr. Saenz included one more little feature just for us: if you scrolled right on the spreadsheet, an extremely graphic list of "maritial aids" slid into view, supposed purchases made by the "apple dealers," as seen above. I think they'll be approaching $500 before this year ends, if trends continue. If they can meet demand, there's no reason they can't top $475 or higher. When the year-end quarter, aka 'holiday shopping season' is reported, it will again be record-breaking… that should put them pretty close to over the top. The next big question is, when will they do another split? BTW, again I'm taking issue with the headline being a bit too "sensational"… "Massive crowd"? Then in the article, "hundreds…." Come on. The Tokyo Ginza store opening was "massive"… thousands lined up for a couple of miles on opening day. Hundreds isn't massive… if it is, what do you call the Tokyo store opening? I'm just being conservative, as always... with this economic climate and the like. Surely the stock will reach $500 at some point. It's no brainer. Massive Chinese market over there. What's interesting is will Apple introduce something new before next year ends. Someone predicted TV. If there's just one new product introduced the stock now will looks really cheap. BTW, again I'm taking issue with the headline being a bit too "sensational"? "Massive crowd"? Then in the article, "hundreds?." Come on. The Tokyo Ginza store opening was "massive"? thousands lined up for a couple of miles on opening day. Hundreds isn't massive? if it is, what do you call the Tokyo store opening? You're right that hundreds isn't massive, but if you look at the YouTube video in post #16 you'll see that it was likely well over 1,000 and maybe a couple thousand. So, the headline should be fine and not considered sensational. They should edit the text of the article to reflect reality more. There were thousands in the store. More than 2000, at least. Someone isn't very good at estimating crowds.